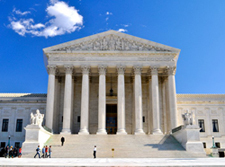 This week I filed an amicus brief in the United States Supreme Court challenging (Noel Canning v. NLRB) the constitutionality of President Obama’s January 2012 “recess” appointments to the National Labor Relations Board. President Obama jammed through appointees that he knew the Senate would not support, in an unprecedented power grab. The United States Courts of Appeals for the D.C. and Third Circuits both declared the President’s appointments unconstitutional. The Administration now has asked the Supreme Court to hear the case. Senate Republicans are fighting this unwarranted expansion of Executive Power and are asking the Court to consider the constitutionality of the January 2012 appointments, including whether the President has the authority to declare the Senate “'unavailable' and thus in Recess” even though it is regularly meeting. You can view the amicus brief here. Please let me know if I can send you any other information.